This is one of the most delicious curry-type dishes that I have tasted in quite a while and I have eaten a lot of curry dishes. It is also the first Burmese-style dish that I have tried and, while I have never been to Burma, the confluence of spices and ingredients seems to be a great reflection of Burma's geography and history with its neighbors. 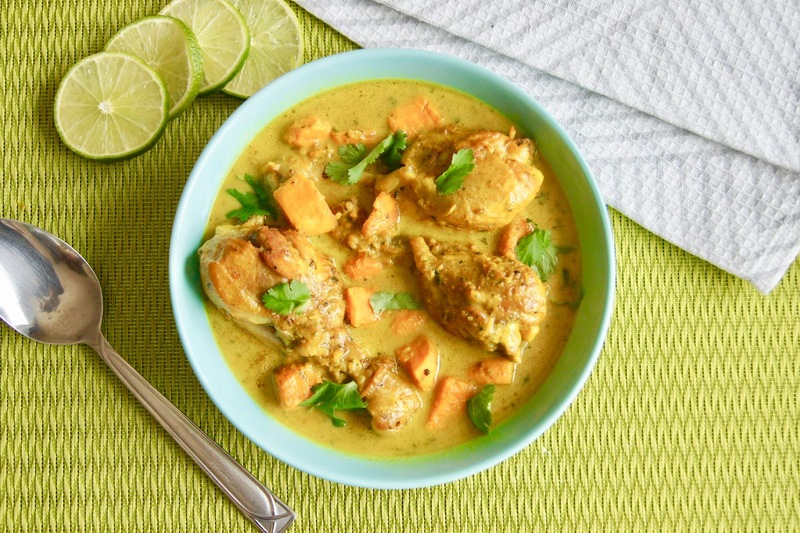 Burma is neatly tucked in between India and Thailand so it is not surprising that turmeric and coriander, two of the stars of Indian cuisine, and the Thai staples coconut milk and fish sauce are main ingredients in the fragrant marinade. The ingredient list is extensive for sure but, step-wise, this is a pretty un-complicated dish to endeavor, and your effort and time would be well worth it. 1. Marinate the chicken with the ground ginger, turmeric, coriander and vegetable oil. Ideally, marinate over night but, if pressed for time, half an hour in the refrigerator would do. 2. In a food processor, mince the garlic, fresh ginger, shallot, chili and cilantro. 3. Add the coconut oil to a heavy-bottomed pan set over medium heat, then add the sweet potato cubes and fry until golden brown on at least two sides. Remove from the pan and set aside. Add the chicken to the remaining oil in the pan and allow to brown. Season with a pinch of salt. Add the shallot-ginger-chili-cilantro mixture and cook for about two minutes until it starts to look a bit grainy. Do not burn. Add a couple tablespoons of the chicken stock and let reduce until the mixture is soft and cooked. Add the rest of the chicken stock and the reserved sweet potato and bring to a simmer. 4. Simmer the soup for about half an hour until the chicken and sweet potatoes are cooked through. Stir in the fish sauce, lime juice and coconut milk and bring back to a simmer. Stir in a quarter cup of cilantro leaves and salt to taste before serving. One of the most challenging things I do on a daily basis is try to encourage my toddler to eat vegetables. To give him credit, he does eat those spicy black bean quinoa burgers from Trader Joes (the ones that were voted one of the best veggie burgers on the market). Besides that, the only substantial sources of vegetable nutrition comes from any that I am able to discreetly sneak into foods, such as kale blended into a green smoothie, grated zucchini baked in a chocolate bread, finely ground peppers and mushrooms incorporated into taco meat, and not forgetting fruit and vegetable pouches - those are heaven sent. Like most toddlers, mine is attracted to colorful foods. And if he can get involved in its preparation, he will be more prone to trying it at least once. To that end, I recruit him quite often to " help" me in the kitchen. 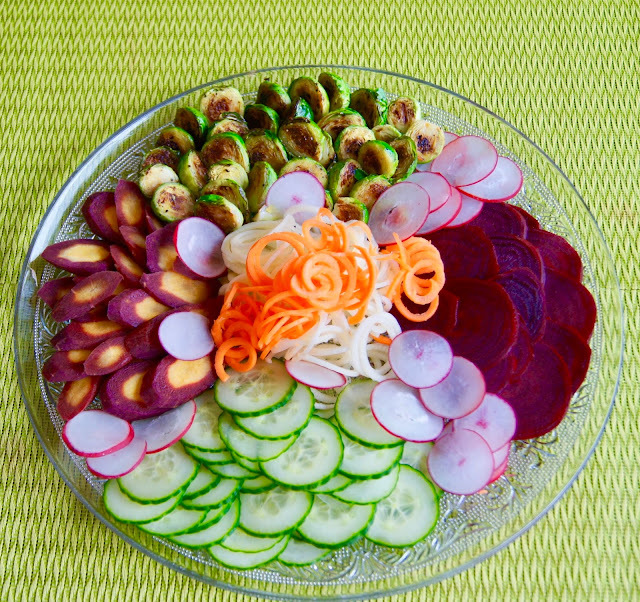 One of the things he loves to do is spiralize vegetables, in spite of his deep-seated vegetable aversion. (Of course, we use the spiralizer together and he is never without adult supervision whenever he is in the kitchen.) Much to my surprise, every vegetable that he has spiralized, he has tasted. So far, cucumber has been added to the list of foods he now eats. Carrots? Beets? Still off the list but Rome wasn't built in a day. It is a challenge trying to encourage healthy behaviors in toddlers. I think the best we can do is lead by example and continue to have healthy options for food available. I try to have a colorful vegetable platter (ideally one that he and I have prepared together) on the table most evenings, as often as time, my patience and energy level would allow. Sometimes, my toddler would eat a few pieces - last night he ate two slices of cucumber and a slice of radish. Other times, he runs from the table screaming for three scopes of ice cream. He likes to keep things interesting, as interesting as I like to keep my vegetable platters. Overnight oats is one of those perfect breakfast foods. It is quick and easy to make, and full of good properties such as fiber and protein, that magical nutrient combo that can keep you satiated until lunch time...on most days! For me, its appeal has to do also with its versatility. Overnight oats can be made with any combination of dried or fresh fruit plus additional flavorings: blueberry and almond, cinnamon and raisin, cherry and vanilla. Possible flavor combinations are endless. When it comes to the liquid ingredient, you can use any type of milk, it all depends on your preference or dietary restriction. This combination of cherry and coconut is one that I am currently enjoying on mornings. Shredded coconut adds just the right amount of sweetness that I am looking for, as well as additional fiber. And the protein? That comes from the soy milk. This is a delicious and healthy breakfast that certainly keeps me full all morning. 1. Mix all of the ingredients together. Place in a sealed container and refrigerate over night. 2. The following morning, remove oats from he refrigerator and stir to determine if it needs additional liquid to reach desired consistency. 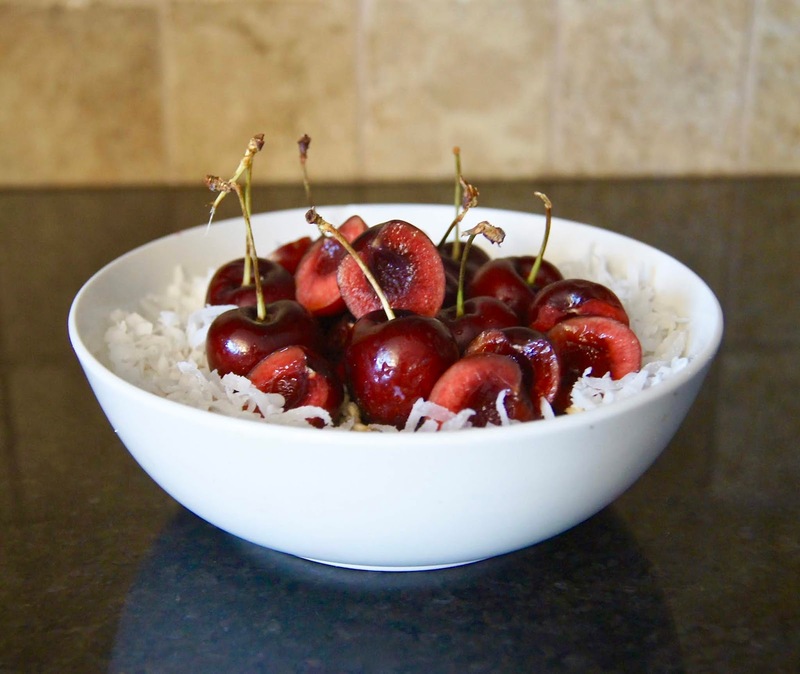 Pour into serving bowl, and top with additional coconut flakes and fresh cherries, if desired. Today is January first, the beginning of a new year. The last year had been a good one, with the birth of my second son (we are now a family of four), a couple of amazing family vacations, and many occasions for laughter and adventure. I am looking forward to more good things this year and, with two boys now, something tells me adventure we would have. The past few days have really been indulgent - it was the holiday season after all - so I am looking forward to eating lighter and incorporating more of plant-based slant to my cooking this year. 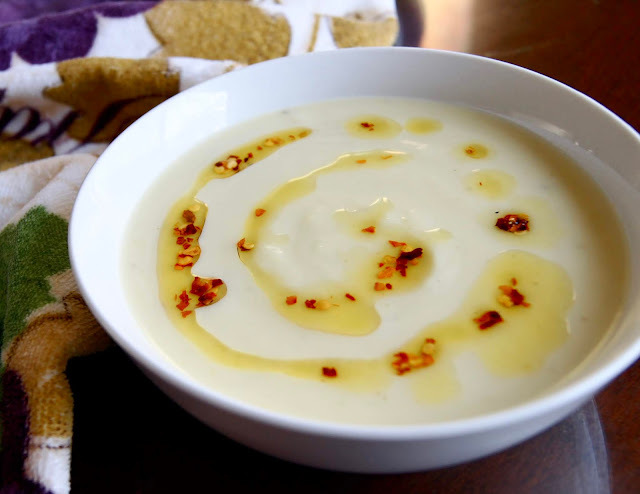 Soups are an easy way to fill up while consuming less calories, and lends it self nicely to the incorporation of vegetables. This leek and potato soup is nutritious and totally vegan and, when paired with a generous piece of fresh baguette, is perfect middle-of-winter food. I have chosen to drizzle a chili-infused oil at the end but this is quite optional. Here's to your good health. Happy New Year! 1. Heat a dutch oven or other heavy pot over medium heat. Add the olive oil followed by the leeks, scallions and thyme. Season lightly with salt. Cook until the leeks have softened well, stirring occasionally, for about 10 to 15 minutes. Take care to reduce the heat to low, if necessary, to prevent burning. 2. Add the potatoes and vegetable stock. Stir well. Bring to a boil, reduce heat and simmer until the potatoes are soft, approximately 30 minutes. 3. Turn off the heat, and remove and discard the sprigs of thyme. Using an immersion blender, puree until smooth. Stir in the soy milk and season with additional salt and pepper to taste. Serve warm drizzled with optional chili oil. *To make the chili oil, add 1/4 cup of vegetable oil to a sauce pan over medium heat. Add 1 tbsp crushed chili flakes. Warm the oil and chili, being careful not to burn the pepper, for about two minutes. Beets. It is my one odd pregnancy craving this time around. The quickest, and probably the most beautiful, way to enjoy these gorgeous red gems is in a smoothie. This Beet and Date smoothie, or some variation of it (I've substituted dark cherries for dates in one version) has become my go-to breakfast recently. But probably, the best unintended result of my new-found beet addiction is the fact that my toddler also got on board. He's probably attracted to the color and has no idea he's getting almost an entire serving of vegetables. But I'll take that as a win for this Mommy. Blend all ingredients together. Serve with berries on top.